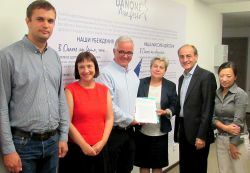 On August 28 2015, two IUF affiliates representing Danone workers in Russia - AIWUR and NOVOIPROF - ratified a new national agreement with Danone Russia. The agreement aims to clarify the provisions of Danone-IUF 1997 agreement applied in case of changes in activities related to employment or terms of employment and interpret it in a way to be fully implemented in line with the national legislation and local context. The national agreement gives a specified definition of the "significant changes of employment" to include not only redundancies but also changes of content and intensity of labour, worsening of labour terms, working hours, wages and benefits. This provision is highly relevant for the workers in Russia where surveys demonstrate that majority of employers prefer to cut costs in the face of current economic crises hitting the country by using standstills or reduction of bonuses (which constitute up to 70-80% of worker's income - up to 35% at Danone). The national agreement elaborates the procedure and the framework of the negotiation and puts a special emphasis on gender issue by providing an additional protection to pregnant women, young mothers, single parents and parents raising children with disabilities - as well as to a number of other "socially sensitive" groups of employees. As part of the implementation procedure, the signatory unions will provide special training on the agreement to all Danone employees in Russia.